This time, I'm REALLY going off-script. In fact, there's no script at all! There is a lot of mint in my garden. The kids nibble on the leaves when they're out playing, I make mint jelly, and sometimes I cook zucchini and carrots with it. But I don't have a lot of other things to do with the mint. However, I'm close to a family from Brazil, and was informed of an easy drink that is enjoyed there - blend a pineapple with a bunch of mint leaves and drink. We tried it, and it's yummy. The gears in my brain started turning and I thought, how about jam? 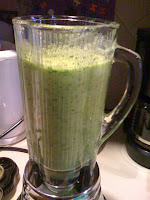 Here's what I did: blend 1 pineapple with about 10 stalks of mint (just the leaves) in a blender. 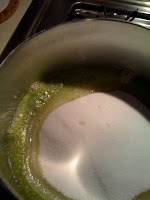 This made about 4 cups of a pretty green frothy mixture. Then I added 5 cups of sugar and 2 tablespoons of lemon juice and boiled it up. Once it was boiling, I added a package of Certo. It was no longer a pretty green but more of an olive green as the mint had cooked. It smells very nice, or at least my mom said it did (I have a cold and can't smell anything). I ended up with 5 half-pint jars and a little more. I plan to give some to my Brazilian friends. * If you use whole or low-fat milk you can reduce the amount of olive oil. Combine egg, milk, olive oil, and parmesan cheese and slowly heat to medium-low, stirring to melt cheese. Add lemon zest and salt and pepper to taste. Cook pasta as directed, and 1-2 minutes before it's done, throw peas in the boiling water. Drain pasta and peas, saving some of the pasta water. Add proscuitto, cheese sauce, and mint to pasta, tossing to combine (add reserved pasta water if needed). Serve with extra parmesan cheese. Serves 4.